If An Inconvenient Truth were the equivalent, as environmental presentations go, of a rock show with pyrotechnics, then Al Gore’s talk Thursday night at the Saban Theater in Beverly Hills could have been called “Al Unplugged.” Roaming often in front of a solitary podium and without the multimedia presentations that formed the core of his Academy Award-winning documentary, Gore spoke eloquently (and entirely without notes) about his new book, Our Choice: A Plan to Solve the Climate Crisis (Rodale, $27). Our Choice is both “textbooklike” and lavishly illustrated with stunning photos and pretty graphics (just how does biomass become biofuel?). The book is geared less toward individuals who want tips on clotheslines and recycling, and more toward those interested in the large-scale technologies being considered as global solutions to the climate problem. “It’s important for you to change the light-bulbs and the windows; it’s a lot more important to change the laws and the policies,” he said. In fact, the 2007 Nobel Peace Prize winner twice mentioned Copenhagen on Thursday night in reference to next month’s United Nations Climate Change Conference, where the hope will be for a binding global treaty. “The alternative to not getting an agreement at Copenhagen is unacceptable,” Gore said. He has his critics: on one side are those who charge Gore has exaggerated the scope of global warming and benefited financially from his environmental crusade (he’s donating proceeds from the book to his non-profit Alliance for Climate Protection); on the other are those who believe Gore hasn’t gone far enough, like the smattering of protestors who gathered in front of the theater Thursday night to criticize his more lenient stance on the meat industries. And yet, the Gore crossing the stage inside was still very much the persona of the 2000 election. At times he was a pedant (he lost me in his discussion of the relative merits of photovoltaics, and he was just getting started), at times he was a charming Southern gentleman (he loves Taylor Swift). 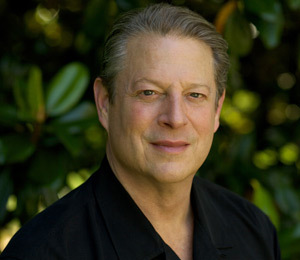 At times, he was a powerful orator (his insistence that a failure to solve the climate crisis would be the “single most immoral act of any generation that has ever lived on this planet” solicited cheers), and he was ever the politician: the book-signing line stretched hundreds long after the talk—I didn’t wait, but Gore looked prepared to greet them all.